Farscallop is the 842nd highest place in Ireland. Long broad wet ridges with good wilderness views. Farscallop is a summit that lines the SE and upper side of Derryveagh Valley. It can be reached from the rear entrance of the Glenveagh National Park at around B9710 1582 A. Walk up the boggy slope. After around 1km you will gain slightly better ground and great views such as that towards the summits on the north west side of the Derryveagh Valley. A round trip doing this should take around 2 hours. It could also be reached from the NE end of Lough Beagh though this will be considerably longer. 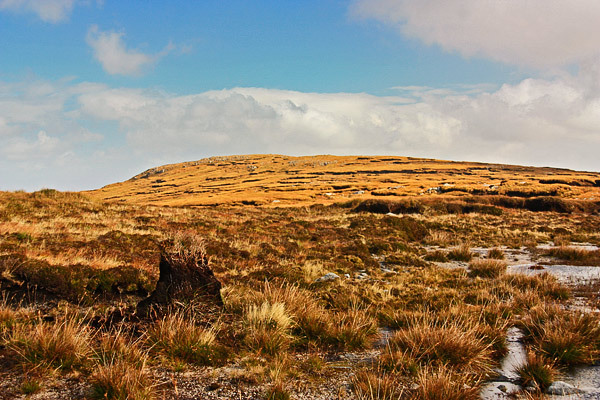 The summit has views also towards the wild and remote land of the Glenveagh National Park to the east such as Leahanmore. There's little trace now however, before extreme evictions in the early 1860s, apparently some 44 families lived around the Derryveagh Valley.